The Geese Have Gone Over The Water, Brighton & Hove, BN2 9UA. 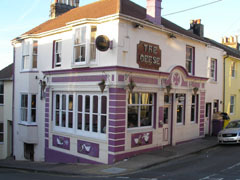 The Geese Have Gone Over The Water pub review, map and rating. Looking for a Hotel near The Geese Have Gone Over The Water? I had been down to Brighton visiting friends in Hanover area and stopped in at the Geese. Previously had gone by as it had looked uninviting whereas this time it caught my eye. I had a drink and then had the fish and chips dinner which I will be returning for again on my next visit to Hanover. Lovely pub!! Will definately return for a night time visit as they are holding a jazz night. Good luck to the new owners ps. the outside restoration is delightful! We passed this bar by chance, decided to stop for some food (Sunday Roast) the food was delicious and extremely good value. A very light and airy feel, owners and staff very nice and friendly. Children always welcome and the owner brought out a bowl of water for a dog whose owner had stopped for a drink, a lovely gesture. Well worth a visit, we shall be stopping by to sample the mid week menu which looks good too! Under new management. Cleaning up but trying to be an old school boozer not a Brighton bar. A good pint of Harveys and the pizzas smelt great. There is a big TV but this seems to be on for the main matches not 24/7. Has the makings of a good local, plays eclectic music and I hear they have just started a live music night on Sundays... not been to it yet so can't say more. Worth a visit if you are in the area, if it is quiet there are a pile of newspapers... works for me! P.S Got a few in on happy hour! The Geese has recently changed hands and now has sky sports HD with a new massive screen. Fantastic for watching football. Also serves cheap pizza. Probably the best place to watch football out of all the hanover pubs. Can be a bit empty at other times.